Join Michael DeForge at Librairie Drawn & Quarterly (211 Bernard O.) TONIGHT at 7pm (come early, it's going to be a packed house!) 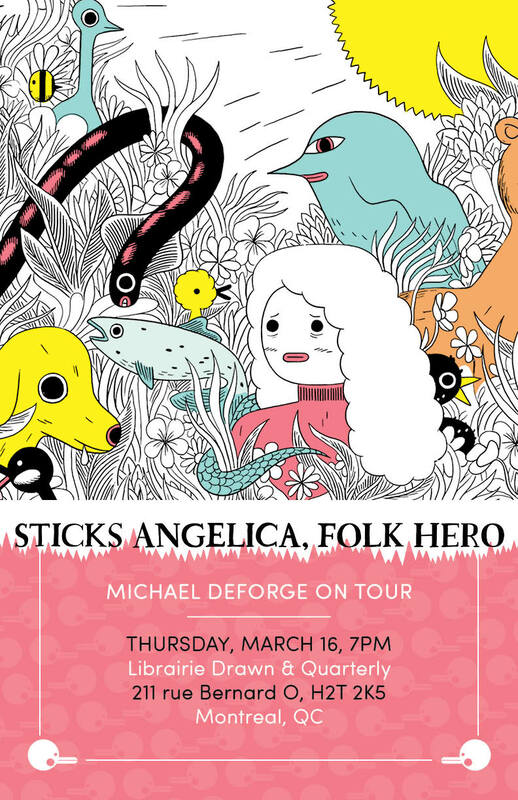 for a live reading and book signing as he introduces the world to Sticks Angelica, Folk Hero! Sticks has escaped her heritage for the refuge of the woods and through her story, DeForge delivers another deeply humane work, one that subtly questions the integrity of the political state and contemporary journalism, all while investigating our relationship to the natural world. MICHAEL DEFORGE was born in 1987 and grew up in Ottawa, Ontario. His one-person anthology series Lose has been nominated for, or won, every major comics award including the Ignatz and Eisner awards. His previous graphic novels with Drawn & Quarterly are Ant Colony, Big Kids, and First Year Healthy.